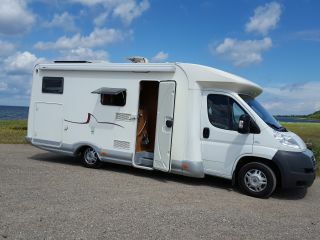 Very spacious 4 person Integral Hymer B 574 with garage, air conditioning, fixed bed and lift bed for rent! Equipped with all conveniences such as spacious shower and toilet, very comfortable Isri Piloten seats with adjustable armrests, electric entry, towbar, solar panel, driver's and passenger's seat, both swivel! The camper has recently been fully inspected and is subject to a Camper check. Motor in good condition and drives very well. Very much storage space, a kitchen with fridge, three gas burners and a sink, a shower room with toilet and hand shower, on the back a bicycle rack for 3 bicycles. Over the entire width a large canopy. The camper is child and dog friendly, both are allowed. Don't smoke at all! The camper is fully furnished, gas cylinders, electricity cords, fully kitchen utensils, 4 chairs, outside table, groundsheet, etc. all clean and fresh. When picking up the Camper you can park your car with us free of charge! 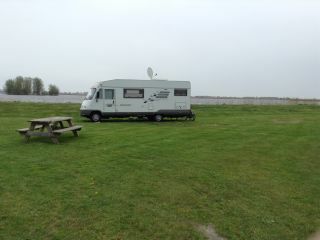 We deliver the Hymer both inside and outside clean and fully refueled! We expect the camper return as we deliver it. If this is not the case, we charge 75 euros for cleaning the inside. Response from Frank Hoi Luc en marjolein, super dat jullie de moeite nemen om deze mooie recensie te schrijven. Waarvoor wij jullie dan ook hartelijk willen bedanken! Wie weet tot ooit! Groetjes Frank en Hariëtte.